by John H. Leach, Sr. Warden Sojourners Lodge, C. Z.
Thirty-five years ago, in 1899, thirteen Masonic brethren assembled in the city of Colon, at the northern entrance of the Panama Canal, and organized a lodge. The brethren were English-speaking Masons sojourning in this corner of the Caribbean, while engaged in the pursuit of various commercial activities. Their petition for a charter was addressed to the Grand Lodge of Scotland, and upon its being granted, they became known as Sojourners Lodge No. 874. Their meetings, according to their by-laws, were held "on the first Saturday nearest the full moon of each month." They met in a tin-roofed wooden frame structure of a type common throughout the city. These buildings, while protecting a person from the heavy rains, and allowing him the privacy of a thin wooden wall, were always potential victims of fire, and Colon had many of them; one fire, during the year 1905, destroyed the home of the lodge together with all the records as well as the charter. The lodge became dormant, and remained so until early the following year, when the request for a duplicate charter brought them one, whereupon, they sought out a new home and resumed their labors. Colon is referred to, here, as a city, but in those very early days it was more of a cosmopolitan village, a seaport town, despite the heavy movement of traffic across the isthmus on the railroad. With the building of the Panama Canal under way, and the great number of men recently arrived and arriving. Colon and the twin city of Cristobal began their growth. Equally so with the fraternity, at that time there began an upward swing in Masonry, a growth that only began to subside during the 1920's. By 1913 the membership of Sojourners Lodge was largely of North American origin, and many times increased over the original group. Due to Scottish and American ritualistic differences and the desire to belong to a jurisdiction nearer home, the members gave up their Scottish charter and petitioned the Grand Lodge of Massachusetts for recognition. By receiving their new charter they lost their number but retained their name. A few years earlier than this they had moved into their third lodge home. This time, it was the de Lesseps Palace in Cristobal, the former home of the leader of the French attempt at building a Panama Canal. Meanwhile dissatisfaction with the more or less temporary homes and the desire for a permanent abode, led them to appoint a committee to find ways and means. With considerable effort and ingenuity the committee succeeded; and Sojourners Lodge found itself owner of four lots, covering an area of ninety by one hundred twenty feet in Cristobal, close to the boundary line of the twin cities. To secure these lots an act was passed by the United States Congress to authorize purchase. As all land acquired by the Panama Canal Commission could never be sold to any private individual or organization, such congressional action was necessary. The Masonic Temple in Cristobal, up to the present day, is on the only privately owned property within the Canal Zone. As soon as the legal requirements were finished, construction was begun. The cornerstone was laid on Memorial Day, 1911, and the Temple was completed and occupied in April, 1913. Not only were the brethren proud of having a most modern and up to date building at that time, but it was also the tallest building in either Colon or Cristobal. It contained three stories and one mezzanine floor. The two lower floors were occupied with offices. The third and mezzanine floors were exclusively for the fraternity; a lodgeroom, banquet hall, reading room, and a number of smaller rooms completed the arrangements. Here, at last, they had a place where they could continue their labors with befitting dignity, or refresh themselves or find recreation at any time of the day or night. Today, at any hour, the visitor will find himself welcome. Shortly after the completion of the temple, the banquet hall was made use of by the District Court of Cristobal in administering justice. A great many and variety of cases were passed upon, the most serious of which was one of three negroes sentenced to death for murder. Several years ago an air conditioning machine was installed, and the members felt that they had at last defeated the warmth and dampness of a tropic evening. No more does the Master's collar wilt about his neck nor perspiration show through the white coat of the Senior Deacon; nor does the brother sitting on the sidelines make mental comparisons with the warmer place below. With a temperature of about 70° and humidity noticeably dry, an enjoyable evening can always be looked forward to. One only discovers how warm and damp the tropic climate is when emerging from an evening session in the lodgeroom. Five of the original members of Sojourners Lodge came from Infant Harmonic Lodge 356, St. Thomas, Virgin Islands, which is over 115 years of age. The others came from Jamaica, several from the states and places of origin unknown. Looking over the roster today, which contains some five hundred names, we find a	large portion of the members widely scattered to the North, East, South and West. Here is a name in Seward, Alaska; one in Honolulu; another in Madrid, Spain; then there is Shanghai, China; various parts of the States; and in the United States naval battle fleet. In the visitors' register we see England (London to be exact) recorded as the home address. Continuing on, Edinburgh is scrawled on another line. Turn a few pages and you find a brother from Australia. Chile, Venezuela, Peru, India, Canada, China, are represented, but the greatest portion from "home," up North. Truly a cosmopolitan list, but in many ways typical of the best writers of the Craft and showing by their frequent attendance at meetings a keen desire to observe the practice of the Craft not only in the fraternal relationship hut in a life standard of ritualistic work. In the beginning, Sojourners Lodge had its birth in the City of Colon on January 14, 1898, when a number of Brethren under the leadership of Worshipful Brother Adolphus P. Alberga petitioned the Grand Lodge of Scotland for a charter. Thus, Sojourners Lodge No. 874 began its history under Scottish Jurisdiction. There were thirteen founding members of Sojourners Lodge No. 874. They were: Adolphus P. Alberga, Edwin Farrington, William R. Evans, Moses D. Cardozo, Robert Anderson, Gerald G. H. Waldron, Robert Yung, Isaac A. Sasso, Arthur O'Brien, Morris S. Sasso, Joel Benjamin, Samuel M. de Castro, Isaac L. Maduro, Sr. Some of these family names you will recognize in the business world of the Republic of Panama today and still active in Masonry. Wor. Brother Adolphus P. Alberga deserves special mention. He was initiated in Friendly Lodge No. 239, Kingston, Jamaica, and was active in Masonry previous to the organization of Sojourners Lodge. He was Right Worshipful Master of Sojourners Lodge No. 874 from 1898 to 1902, the first five years of its life. He was elected to Honorary Life Membership in the present Sojourners Lodge. Wor. Bro. Alberga departed this life at the age of 85 years in Chicago, Illinois, June 18, 1934. Up until 1906, Sojourners Lodge had survived the political upsets of the Government, the war of Independence from Colombia in 1903, and a fire on September 20, 1905, which destroyed their Masonic home. 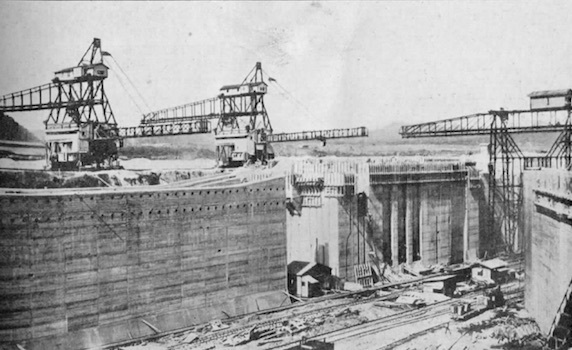 In 1904, the United States began the job of building the Panama Canal and gradually an increasing number of American citizens came to the Isthmus. By 1906 the number had multiplied and some of them petitioned Sojourners Lodge No. 874, and consequently the membership of Sojourners Lodge became largely American. There is not space and time enough to mention all the outstanding Brothers who have furthered the welfare of Sojourners Lodge during the many past years. However, there never has been a problem, or a task, or a huge undertaking, but that there was always a capable member who seemed to appear when his talents were needed. Wor. Wilber S. Perry was one of these people. He was initiated in Sojourners Lodge on February 16, 1909, and soon became active in its affairs. He was one of a small group of members who actively sought a change from the jurisdiction of the Grand Lodge of Scotland to that of the Grand Lodge of Massachusetts and a home for the Lodge in Cristobal, Canal Zone. He was chairman of the building committee of the new temple. And futher, he was influential in securing Congressional legislation in securing title to this property which still at this time is the only privately owned land in the Canal Zone. 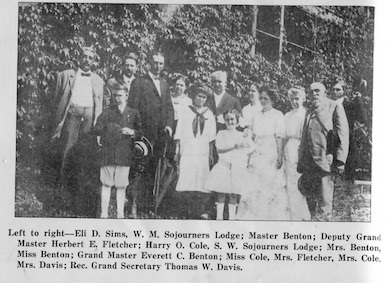 In July of 1912, Sojourners Lodge surrendered its charter to the Grand Lodge of Scotland and became a Lodge under Dispensation under the Grand Lodge of Massachusetts. At this time its membership totalled 330 members with the vast majority being United States citizens. It was back in 1909 that the members talked about building a home of their own in the Canal Zone. Within a few months they went to work. Bonds were issued and construction started on the building late in 1910. The corner-stone was laid with ceremony on May 30, 1911. When the steel framework had been completed, it was found that the northeast corner had sunk to a considerable degree. The building committee had spent approximately $60,000 and no further funds were available. This was the first of several disappointments. A committee from the Lodge called upon Col. George W. Goethals, Chairman and Chief Engineer of the Isthmian Canal Commission, and requested that he authorize the Panama Railroad to complete the building and give the Lodge the option of purchase at any time within five years following its completion. On July 7, 1913, an agreement was entered into between the Panama Railroad and the Lodge under which the Railroad would complete the building and Sojourners Lodge would pay the Railroad $250.00 annual rental for the mezzanine floor and roof of the Temple. The contract gave the Lodge the option of purchasing the building within a period of five years from the date of contract, at the total cost thereof when completed, with interest at the rate of eight per cent. By 1915 the construction had been sufficiently advanced to allow the Lodge to prepare an opening ceremony for the night of Saturday, May 1, 1915. On April 30, 1915, a fire broke out in Colon at the corner of Eighth Street and Bottle Alley. By the time the Brethren had removed the rug and furniture from the lodge-room, the lodge-room and the stores and officers on the first and second floors were gutted on the north and east sides of the building. Repairs to the Temple were completed late in August and the delayed first meeting and banquet were held early in September. Shortly after occupying the building, plans were made to purchase the building. Early in 1916 Governor Goethals issued instructions for the preparation of a contract covering the sale of the building. The price was set at $130,000 and a rental of $650.00 per year for the four lots. Preparations were made to execute this contract when the attorney for the Panama Railroad ruled that neither the Panama Railroad nor the Governor had authority to sell any property in the Canal Zone. Since the passing of the Act in 1912, only Congress could authorize the sale. This was another set back, but with temerity and confidence, this problem was taken in stride. Several officers, while on leave, found many friends in Washington who were ready and anxious to assist in helping the Lodge solve this problem. Mention should be made here of Judge C. P. Fairman, who was not a Mason but was a tenant in the building and legal counsel for Sojourners Lodge. Without the knowledge of the officers and members, Judge Fairman made a trip to Washington and made some valuable contacts and assisted in preparing the bill which was introduced to Congress on our behalf. On June 5, 1920, the Congress passed the act authorizing the sale of the Temple and the land on which it stands. Then began a series of conferences between the Special Committee of the Lodge and Col. Jay J. Morrow, who represented the Governor. The Lodge Committee contended that a token payment of $1.00 was all that the Government should ask for the lots, but Col. Morrow insisted upon a real value being placed on the lots and after further conferences, the Lodge agreed to pay $8,500 for the lots and $136,500 for the building, a total of $145,000. This agreement was signed on April 21, 1921, and required that the Lodge pay $1,000 per quarter with interest at 6% on the outstanding balance. In 1920, Sojourners Lodge had 435 members who came from the civilian communities and the Army and Navy. These members came from all parts of the United States. While the majority of our civilian members were with the Panama Canal organization, they remained until their time of retirement. This was not so with our military brothers. When their tours of duty were finished on the Isthmus, they were transferred to other places. This is the pattern of our membership which has followed through the years. Regrettably, due to their limited time on the Isthmus, our Brethren in the Armed Services did not have much opportunity to work as officers of the Lodge. Sojourners Lodge has had only one Past Master who came from the Armed Services, and that is Worshipful Walter A. O. Freudigmann, who was in the Navy. Wor. Bro. Freudigmann was Master in 1948, is now retired and living in Tampa, Florida. However, due to our military Brethren, Sojourners Lodge can lay claim to the statement that during the past fifty years, there is not a country in the world in which there has not been a member of Sojourners Lodge. During the past fifty years, Sojourners Lodge had forty-nine Past Masters. One Master served two years. He was R. W. Ralph Osborn, Master in 1916 and 1917, and later District Grand Master, serving in that office from 1918 to 1932. R. W. Brother Osborn died November 23, 1932. Of the several Secretaries that Sojourners Lodge has had, mention should be made of two of them. The first was Brother Charles Cotton, initiated in 1913 and elected Secretary in 1917. He served for thirteen years. In going back through the records, I found a note referring to Brother Cotton and his safeguarding every cent during the early years. The Brothers plaintively complained that they "had to talk to Old Man Cotton for two hours to get him to buy a box of cigars for a Master Mason meeting." 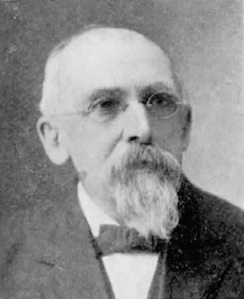 Brother Cotton was succeeded by his son, Wor. Bro. Ernest C. Cotton, who was Master in 1928 and was selected Secretary in 1931. Fie served until 1943, a total of 12 years, one year less than his father. Wor. Bro. Cotton, aside from his secretarial duties, was closely associated with community affairs. He was also a Past District Junior Grand Warden of the District Grand Lodge. Besides the two members just mentioned, Sojourners Lodge has been represented in the District Grand Lodge by the following officers: R. W. Clarence J. Johnston, Past District Grand Master; Wor. Clinton G. Carty, and R. W. Clarence L. Johnston, Past Deputy District Grand Masters; Wor. Lee W. Kelso and Wor. John H. Leach, Past District Senior Grand Wardens; Wor. Thomas M. Jordan and Wor. Norman B. Davison, Past District Junior Grand Wardens. According to our numerical system, 2704 petitions were filled out for presentation to the Lodge. However, from an examination of the Lodge Returns for the past fifty years, I find that we initiated 1431 profane and that we raised and admitted and affiliated 1485. We rejected 616. In 1913, according to the Returns we had 239 members. This grew to 521 members in 1930 and then dropped. During World War II our membership increased again. Our peak period was in 1950 when we had a total of 643 members. Since then this has dropped off to 598 members as of last August On March 10, 1956, Sojourners Lodge held the first Master Mason Degree ever given at the historic Fort San Lorenzo. On March 9, 1957, a second one was held there. On March 7, 1959, Sojourners and Sibert Lodges together held the third meeting at Fort San Lorenzo. Such is the history of our Lodge. Today we find ourselves at another crossroads. Due to the present policy of the Panama Canal organization, there will be fewer and fewer Americans on the Canal Zone. The Armed Services have less military personnel here. We find ourselves with fewer candidates. The larger portion of our membership is in all fifty of the United States. We have one member in Alaska and one in Hawaii. There are only three states in which we do not have members; they are Idaho, Wisconsin and Vermont. As we look into the past, we can also look confidently into the future. For, as our Brethren of the past gave us the name of "Sojourners", we find ourselves truly — Sojourners. We are only here for a varying length of time. Tomorrow, some other Brother will pick up our tasks and continue to serve Masonry during his sojourn, and thus goes Masonry on and on. No talk on Atlantic-side Masonry would be complete without pointing out that evidence of the existence of Freemasonrv was found in the early part of the 18th century in the ruins of the old City of Portobello, which was founded by the Spaniards in 1597. and if one were to accept this as a fact, it would appear that Freemasonry existed on the Isthmus since the time of the conquest by the Spaniards. Authentic evidence does exist to show that in 1822 a few North American citizens, residing on the Isthmus, requested from the Grand Lodge of New York a charter under dispensation with a view of organizing a Lodge in the City of Panama to be named "La Mejor Union". This effort to organize a Masonic Lodge failed, and it is reported that another attempt was made to raise the pillars of Masonry in Panama. In December 1850, a Lodge under dispensation named "Union" held its first communication under a charter from the Grand Lodge of Texas. Various other attempts were made during the latter part of the 19th century to establish Masonic Lodges, but not until February 1898 was any Lodge established on the Atlantic side of the Isthmus. In that year, the Grand Lodge of Scotland granted a charter for the establishment of Sojourners Lodge No. 874, in the City of Colon. At the time Panama severed its political relations with Colombia and declared its independence, November 3, 1903, Sojourners Lodge was the only active Masonic Lodge on the Isthmus. The Republic of Panama was then regarded as open Masonic ground, as the Supreme Council of Colombia (seat at Cartagena) did not have any Lodge in the Republic. During the next ten years, Masonry developed considerably, and it was at this time (1913) that the first attempt was made to organize the Grand Lodge of Panama. This Grand Lodge was recognized by only a few Grand Bodies of South America, viz., Venezuela, Guatemala, and the Dominican Republic. It was also accepted as a member of the International Masonic Association, with seat at Neuchatel, Switzerland. During its existence, this Grand Lodge issued a charter to a new Lodge composed of English-speaking Masons in the City of Panama, named Unity No. 7. It was not until April 19, 1916, that Panama recognized the importance of Freemasonry, when the representative of every Lodge in the City of Panama met with the consent of the Grand Lodge of Venezuela and the Supreme Council of Colombia, and founded the Grand Lodge of Panama and began to prepare a constitution, which passed its first and second reading and was signed on August 16, 1916. Election of Grand Lodge officers followed. They were installed October 12, 1916, at a special communication of the Grand Lodge of Panama. The Grand Lodge of Panama, thus organized, was welcomed by Masonry in general, and particularly by the Most Worshipful Grand Lodge of Massachusetts. Most Worshipful Melvin M. Johnson, Past Grand Master, and Special Envoy to Isthmian Masonry, during a visit to the Isthmus, signed a treaty of Recognition and Jurisdiction, whereby the Grand Lodge of Massachusetts recognized the Grand Lodge of Panama as a sovereign, regular and true Grand Lodge, and the Grand Lodge of Panama in its turn waived jurisdiction over the Canal Zone in favor of the Grand Lodge Massachusetts. This treaty was signed and ratified in the City of Panama, June 24, 1917. At this time, Most Worshipful Sir, I would like to introduce two of the charter members of Doric Lodge who are with us this evening, Worshipful Eustace Lee, Senior Past Master of Doric Lodge, and Worshipful Ralph F. Lam. It is interesting to note that the Grand Lodge of Panama, recognizing the need of having a uniform ritual, passed a law in 1920 whereby it adopted the ritual authorized by the Grand Lodge of Massachusetts. This was translated into Spanish and is used by the Spanish-speaking Lodges, of which Atlantida #6 is one. By special dispensation of the Grand Lodge of Panama, Union #7 and Doric #9 were given permission to work in the English language, using the Ancient York Ritual authorized by the Grand Lodge of England. Atlantida #6 originally held its meetings in a lodge-room located at Third and Central Avenue, with Union #7 and Doric #9 holding their meetings in a lodge-room located on Seventh Street. On February 14, 1959, an event of special importance to the Masons of Colon took place when a new temple, located at Seventh Street and Santa Isabella, was consecrated. The three Lodges above-named now meet in the same temple. 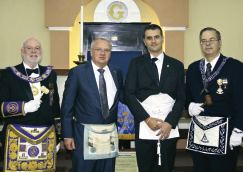 The present Grand Master of Masons in Panama is the Most Worshipful Ricardo Garcia. I would at this time call the attention of all the Brethren to a special communication to be held February 3, 1962, at the Masonic Temple, Colon, at which time the Grand Lodge of Panama will pay an official visit, and Doric Lodge #9 will exemplify the First Degree on two candidates, to which all are invited. The French have an old proverb, Le succes se fait de petites choses, mais le succes n'est pas une petite chose, or translated into English, "Success is made up of little things, but success is not a little thing." I would like to paraphrase that proverb this evening by saying, "The tradition of a Masonic Lodge is made up of little things, but the tradition of a Masonic Lodge is not a little thing." I don't suppose any one man could think of all the things which have gone into the tradition of Sojourners Lodge in the past fifty years under the Grand Lodge of Massachusetts and in the fourteen years preceding it under the Grand Lodge of Scotland. Wor. Bro. Leach has already given you an outline of outstanding events in our Lodge's history. I would like to direct your attention to some of the things in the lodge-room itself which, in a way, form part of the Lodge's tradition, because their presence in the Lodge has made part of the atmosphere which has greeted candidates and members over the years. In the first place, the lodge-room is situated according to the compass. The northeast corner of the Lodge is in the northeast corner of the Canal Zone at this point of that territory. The green border around the ceiling is the color of the Grand Lodge of Scotland and thereby continually reminds us of our origin in that ancient and honorable body. In 1955, during my year as Master, we were painting out the interior of the building and, because it is quite a job to trim such a border, we started to paint out the two borders in white. Our caretaker, Scotty, who has been a member of a Scottish Lodge for over fifty years, soon told me what the green stood for; so we painted it back in along with the blue which stands for the Grand Lodge of Massachusetts. Let no future member of Sojourners Lodge ever fail to maintain that border in green and blue! Old Sojourners Lodge No. 874 was originally housed in Colon and moved in 1908 to the old lodge hall in Cristobal. In the meeting place at Fifth and Bolivar were three chairs for the Master and Wardens which had been stolen. One was salvaged from Sam Gorin's pawn shop in Colon and was placed in the southeast corner of the room. This chair was the old Master's chair and was made in Scotland. Some of the Lodge furniture is as old as the new Sojourners Lodge. The altar has been with us since 1911 and, I am informed, we still have the old original altar upstairs. The length-wise benches in the room are unique, as all other Lodges have soft theater-type seats. These benches, Brethren, came from the old Panama Railroad cars of early days. They were located length-wise in the cars and were rebuilt, as far as the wood frames are concerned, as original furniture when this building was built. The cane seats have not been recaned in all these years, - which is a remarkable testimony to the material and workmanship in their manufacture. The brass columns in the west and south and the three lesser lights made of brass are unique (all other Lodges on the Isthmus have wooden fixtures) and are the gift in 1911 of the Jewish community of Colon to Sojourners Lodge. If the Lodge lasts for 200 years, I am sure these will last that long. The organ was given by the members of Sojourners Lodge some 25 years ago. It was the first organ in the lodge halls on the Isthmus and is unique in being built into the building. (Others are all self-contained, portable units.) It also has chimes. Its beautiful tones have accompanied many a Brother as he proceeded through the degrees. Sojourners' members have enjoyed air-conditioning in their lodge-room longer than members of the other Lodges, as this was the first system installed. The acoustics of Sojourners Lodge are different from any other lodge hall. This is the only room with an overall floor covering; others are tile or concrete. This rug, plus the drapes on the walls and the ridged ceiling, make it possible for one to be heard plainly in any portion of this room without straining the voice. The portrait in the northeast corner is of Grand Master Benton of the Grand Lodge of Massachusetts, who presented Sojourners Lodge with its charter. One last item: I might get an argument over whether I should mention this or not. I refer to the stained spot on the rug between the altar and the East. Some might say, "Why hasn't somebody dyed that spot so it won't stick out like a sore thumb?" I might say that a number of attempts have been made with various materials, but none seemed to work and we have now lived with this spot for the last several years. I have speculated about that spot for quite some time now and I would like to suggest that it, too, forms part of the tradition of Sojourners Lodge and should therefore not be removed. Why? To me that spot is a symbol of the long struggle which Masters of Sojourners Lodge had with the old flat roof. For years and years, thousands and thousands of dollars were poured onto the roof in the form of tar and other materials trying to stop the leaks. A few years ago, the water came in somewhere and ran over to and through that brass light fixture overhead to the spot on the rug. This was the last gasp of the flat roof and shortly after, the new roof over the roof, with roof garden dance floor, was erected. The stain is the symbol of that victory over the flood. Brethren, please preserve it in your memories. 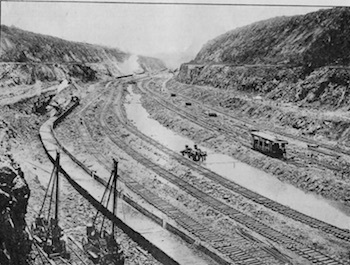 The great work being done by the United States Government in constructing the Panama Canal has been so widely dealt with by the public press, and is now being exploited by comprehensive illustrated lecture to such an extent, that any reference to it would seem to have no special interest for the readers of the Craftsman. The recent visit to the Isthmus by representatives of the Grand Lodge of Massachusetts in an official capacity is worthy of record and remembrance because of the attention called to the policy pursued by the Grand Lodge from its very inception in regard to the encouragement of Masonic enterprise beyond the confines of the Commonwealth, as well as in the exemplification of that policy in the case of the Canal Zone. Expressed briefly, the Grand Lodge has in time past established Lodges in many parts of the World where no Masonic bodies of our rite had already occupied the field, if American citizens were gathered in such numbers as to make desirable their assembling Masonically, provided that there was added to this the wish that such Masonic gatherings should be under the auspices of i he oldest Grand Lodge upon the Western Continent. Not to mention the Lodges established in the eighteenth century outside of Massachusetts, most of which are in existence today, but have become instrumental in the regular formation of new grand jurisdictions it was in pursuance of this policy that, Aug. 17th, 1853, Grand Master Randall granted a dispensation for Bethesda Lodge of Valparaiso, Chile, and that Grand Master Parkman, Dec. 15, 1863, gave a dispensation for Ancient Landmark Lodge at Shanghai, China. Both of these Lodges are under our jurisdiction today. In 1866, a dispensation was granted for a Lodge at Arica, Peru, and the printed records of the Grand Lodge for that year mention Isthmus Lodge at Panama, but to neither of these were Charters ever issued. For several years past it has been the desire of American residents in the Canal Zone that the Grand Lodge of Massachusetts should establish a Lodge in that territory. In the absence of such a body many of the Brethren connected themselves with Sojourners Lodge, under the jurisdiction of Scotland, and located at Colon, on the Atlantic side of the Isthmus. So long as that Lodge was in operation, the formation of a new Lodge was not deemed expedient, but it was finally agreed by all parties that Sojourners Lodge should surrender its Charter; that the Brethren who desired should receive a dispensation from Massachusetts; and that at the completion of the period of dispensation, a Charter might issue under the same conditions as those governing the issuance of Charters to Lodges in the Commonwealth, the location of the new Sojourners Lodge to be at Christobal, adjoining Colon, within the Canal Zone. The Charter was granted by the Grand Lodge at its last Quarterly Communication, and in the meantime a dispensation was issued in response to a demand for a new Lodge at Ancon, adjoining the city of Panama, on the Pacific side of the Isthmus. A Chapter and a Commandery, under American jurisdiction, had already been established at Las Cascadas, fifteen miles from Panama. The importance of the movement led the Grand Master to desire to constitute the new Lodge in person, and for this purpose he called for the attendance of the Deputy Grand Master and the Recording Grand Secretary, and the remainder of this article is a brief itinerary of their movements. The party which went to the Isthmus consisted of M. W. Everett C. Benton, with Mrs. Benton and two children; R. W. Herbert E. Fletcher and Mrs. Fletcher, R. W. Thomas W. Davis and Mrs. Davis. They left Boston at ten o'clock Tuesday, January 7th, being escorted to New York by about twenty-five friends, ladies and gentlemen, who did not forsake them until they were safely placed upon the steamship Zacapa, of the United Fruit Company's line, which left New York Wednesday noon. Contrary to expectation, the voyage south was a very comfortable one, the course being just outside of the storm which beat upon the coast a few hours later. Port Antonio and Kingston were reached on time; the prevailing trade winds favored the trip across the Caribbean Sea, and Colon was reached at two o'clock on the following Wednesday. Here the party was met by members of the Lodge and their ladies, the government buildings were visited, and in the evening a dinner was served at the old Washington Hotel, the new hotel, a grand fireproof building not being ready for occupancy. Its completion is hoped for by March 15th. 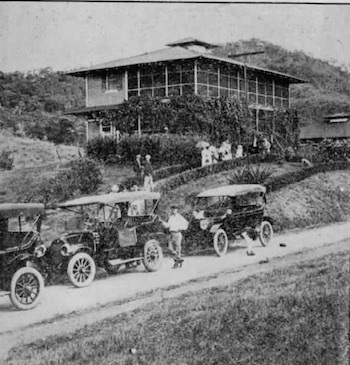 About eleven o'clock that evening, a railroad automobile, intended primely for use of the government officials, and those to whom facilities are given for inspecting the work on the Canal, conveyed the reception committee and the visitors to Panama, where quarters had been provided at the Hotel Tivoli, just outside the city limits. The trip was a beautiful one, as the light of station after station and village after village came into view and the newly risen moon cast a subdued radiance over all. The following day, a committee of the Brethren acted as guides and entertainers over the Pacific Division, the chief points of interest being the locks at Miraflores and Pedro Miguel. W. Bro. Sims and Bro. Cole, who two days later were installed as Master and Senior Warden of Sojourners Lodge, were in charge of the party, and they were entertained at Corozal by Bro. Cole who is Resident Engineer for the Division. The afternoon was occupied by an automobile ride to the ruins of Old Panama, which was destroyed by the buccaneer Morgan in 1671, after an overland march from Porto Bello on the Atlantic coast, during which the invaders suffered almost incredible hardships. Parts of old churches and a ruined bridge are all that mark the site of the ancient city, which, founded in 1521, was in its day the most magnificent in the New World. Its churches were inlaid with gold and silver and it is said to have contained seven thousand houses, many of them of elaborate construction. The city was rebuilt at the foot of the volcanic hill, Ancon, five miles away, where it could more easily be defended against enemies, but it never regained its former commercial importance. Thursday night occurred the landslide of which the newspapers made mention about the first of February, and it was feared that the committee who were to show the work on the Central Division would be unable to discharge their duty, but the tracks were not seriously obstructed and the Culebra Cut was viewed from within and from above under very favorable conditions, the latter being after a dinner at Bas Obispo, at which Bro. Poncian G. Bermudes was the host, followed by a climb to the top of the hill occupied by the camp of the Marine Corps at that place, under the leadership of Capt. Beaumont. 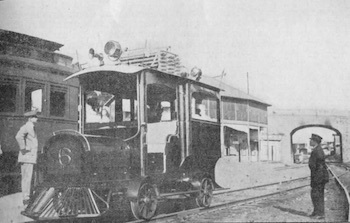 Saturday, taking train at 10.30, the party went to Gatun and were met by the third section of the committee, and were taken over and around the Atlantic side of the great dam, upon the stability of which is said to depend the whole question of the sue cess of the canal, as it retains the water of the new Gatun Lake, the part of the great watercourse through which vessels are to proceed under their own power. Starting for Colon by way of the new canal entrance the launch found wind and wave so heavy that it was decided to turn about and complete the trip by the French canal, on the side of which were to be seen many of the old French dredgers and other abandoned machines, looking like children's toy in comparison with the majority o those now in use. Elsewhere along the work, the old Belgium engines are to be seen, overrun by the tropical growth, some of the better preserved ones, however, still being in use for moving material from point to point. Dinner again at the Washington House,— the Constitution of the Lodge, with its one hundred and ninety charter members,— and return of forty-eight miles to Panama by the midnight train, closed the day. The Lodge is preparing to enter new quarters in a fireproof building, which has been under construction for some months. In the meantime it is located in the headquarters of the Commissary Department, erected under the French regime as a residence for General De Lesseps and it was in this building that the ceremony of Constitution took place. A roll call at the end of the meeting showed that forty states and seven foreign countries were represented among the members and visitors present. Sunday morning, a ride about Panama; in the afternoon a ride for the ladies, and later, a visit by the Grand Master to Canal Zone Lodge, under dispensation. In the evening, a banquet under the auspices of this Lodge was given at the Hotel Tivoli, at which two hundred Brethren and ladies were present. The morning brought about the disintegration of the party. Bro. Fletcher and his wife took the morning train for Colon, from which they sailed at ten o'clock for Jamaica. The writer and Mrs. Davis followed on the noonday train, spending the night at Colon, and taking boat the next day, being joined at Kingston by Bro. and Mrs. Fletcher, while the Grand Master was to resume his journey to Valparaiso on Tuesday. If one assumes to analyze the work being done at the Isthmus, it appears to resolve itself into this: the government is attempting little that is new in engineering or construction, the processes and materials employed are familiar to civil engineers; but everything is upon a scale greater than has been employed, at least in modern days, upon any enterprise; and for this reason challenges the admiration of the world. 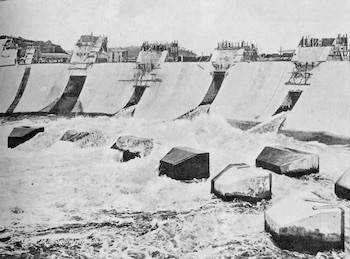 The most important undertaking in connection with the canal was to improve thy sanitary conditions which were so intolerable that the building of the Panama Railroad, sixty years ago, is said to have cost a life for every tie, and of the Europeans engaged in the French work more recently a great majority perished. The extermination of the mosquito (I saw one while at Ancon) meant the end of yellow fever as a scourge; and cold storage with the control of food supplies by government, has made the Canal Zone a place for occupancy by the Anglo-Saxon, and in these things is the success of the work of such stupendous magnitude. Of the enterprise peculiarly in question in the trip the officers of the Grand Lodge made, it can only be said that it was engaged in after careful deliberation, and with advice from those whom the Craft in Massachusetts have recognized as their leader. The errand upon which the part were bound to awaken keen interest upon the part of the Masonic Brethren and the general public who were their fellow travellers; the members of the fraternity in the Canal Zone exhibited an enthusiasm which surpassed all expectation; the presence of the visiting ladies appeared to be especially appreciated by the wives of the Masons of the Canal Zone; and no pains were spared in making the stay upon the Isthmus enjoyable. It is to be hoped that a good deed has been wrought for Masonry and that the end will crown the work. From the Canal Zone comes report of Sojourners Lodge for the past 12 months which is a credit to that organization, containing as it does a list of all the meetings and items of interest during a full and busy year, presented complete and concisely on two pages of a sheet of blue paper. Each member of that lodge can contemplate with satisfaction the service of so fine a secretary who does so satisfactory a job in letting them know just what has transpired in the Masonic outpost. And incidentally he may well have a feeling of pride in the attendance and interesting statistics. Truly we sometimes may look to the outpost for a lesson in how a lodge can serve the Craft successfully — in amity and all the good things for which the Craft stands. We know of no lodge in Massachusetts which gives its membership so fair and full an account of the year's work. The plan could be copied with profit. R. W. John Bamber and members of Sojourners Lodge at their Centennial Degree Communication in August. On February 7, 2012 Sojourners Lodge became officially 100 years old and held a centennial celebration party with special guests including Rt. Wor. District Grand Master John B. Bamber and Grand Master of the Grand Lodge of Panama, Most Wor. Manuel Corredera Gamboa. Masonry in the Canal Zone had its beginnings in 1898 when Sojourners Lodge No. 874 was founded in Colon, Republic of Panama, under the Grand Lodge of Scotland. Over a period of years the membership in Sojourners Lodge became predominantly American. The long delays in communications between Scotland and the desire for closer ties with their homeland, led the members to seek a connection with a Grand Lodge in the United States. A formal request was sent to the Grand Lodge of Massachusetts. The request was approved and a special communication was convened by Grand Master Benton where he constituted Sojourners Lodge in January, 1913 in Christobal, Panama. Sojourners Lodge now resides in Panama City. Membership and attendance is back to where it was in the early 80s. The Lodge continues to grow and looks forward to the next 100 years.